Abu Bakr al-Baghdadi, the head of the Islamic State (IS) militant group, has been careful to reveal little about himself and his whereabouts. Rumours about his death surfaced earlier this year, after reports that he had been seriously wounded in an air strike in March by the US-led coalition that is opposing IS. But the Pentagon said that Baghdadi's fate remained unclear. The IS chief allegedly broke a months-long silence in May by releasing an audio message in which he urged Muslims to emigrate to the "caliphate" that the group has proclaimed in areas of Syria and Iraq. But his only public appearance on video has been to deliver a sermon in Mosul after IS took the northern Iraqi city last year. Before then, there were only two authenticated photos of him. The IS chief also appears to wear a mask to address his commanders, earning the nickname "the invisible sheikh". But Baghdadi - a nom de guerre, rather than his real name - has good reason to maintain a veil of mystery, says the BBC's Security Correspondent, Frank Gardner. One of his predecessors, Abu Musab Al-Zarqawi who headed the most violent jihadist group in Iraq until his death, was a high-profile showman whose secret location was eventually tracked down. He was killed in a US bombing raid in 2006. He may be a shadowy figure, but the organisation he leads is pulling in thousands of new recruits and has become one of the most cohesive militias in the Middle East, our correspondent adds. Baghdadi is believed to have been born in Samarra, north of Baghdad, in 1971. Reports suggest he was a cleric in a mosque in the city around the time of the US-led invasion in 2003. Some believe he was already a militant jihadist during the rule of Saddam Hussein. Others suggest he was radicalised during the four years he was held at Camp Bucca, a US facility in southern Iraq where many al-Qaeda commanders were detained. But Baghdadi has a reputation as a highly organised and ruthless battlefield tactician, which analysts say makes his organisation more attractive to young jihadists than that of Zawahiri, an Islamic theologian. In October 2011, the US officially designated Baghdadi as "terrorist" and offered a $10m (£5.8m; 7.3m euros) reward for information leading to his capture or death. 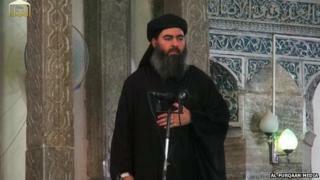 It notes Baghdadi's aliases, including Abu Duaa and Dr Ibrahim Awwad Ibrahim Ali al-Badri al-Samarrai. So there remain more questions than answers about the leader of one of the world's most dangerous jihadist groups.